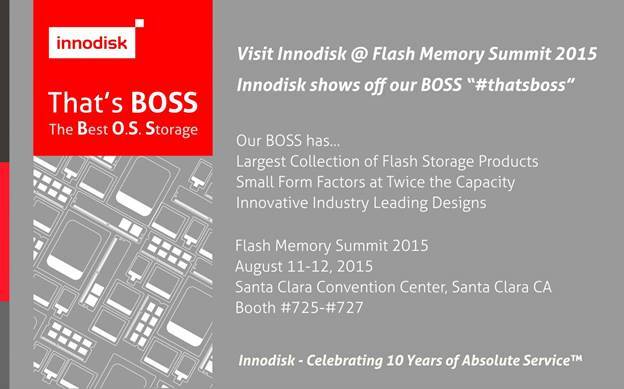 August 4, 2015, Fremont, CA – Innodisk, the innovative service-driven flash provider, proudly exhibits “That’s BOSS” The Best O. S. Storage this coming August 12th and 13th at Flash Memory Summit 2015 in Santa Clara, CA. Innodisk brings to the forefront flash memory products that are more compact, reliable, and provide longer life cycles for industrial embedded systems. While exhibiting the industry’s widest selection of flash memory form factors, Innodisk also displays their DRAM and other value added products. This year CC Wu, Innodisk EVP, is a featured speaker discussing Embedded Flash Storage Solution for IoT. Innodisk will host a private “BOSS Affaire” celebrating “10 Years of Absolute Service”. With over 50 global patents and a dedicated in-house firmware team, Innodisk presents the Best O. S. Storage in today’s market. Innodisk “That’s BOSS” campaign showcases our vast collection of storage products that our customers integrate as an operating system storage device. Innodisk wants to highlight our SATADOM/ServerDOM™ product lines that are small in size, but packs high capacity. These products also come with our patented power on pin 7 design that allows them to plug directly into a SATA port without the need to route an external power cable. This makes them easy to install while improving airflow. Innodisk flash products all come with our iDATA Guard technology which prevents data loss in the event of an abnormal power cycle. 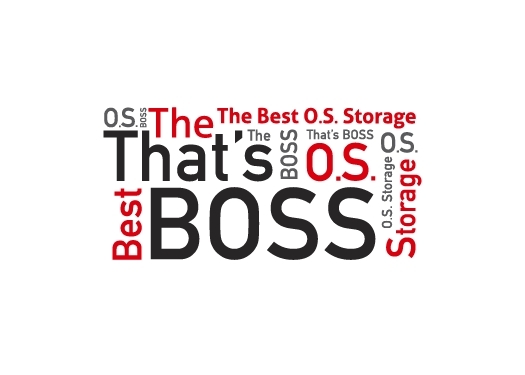 So when we say “That’s BOSS”, think of Innodisk and the best storage solution for your operating system requirements. Innodisk doesn’t just stop at highlighting SATADOM and ServerDOM™ products. There is a rich portfolio of products on display. These product lines include legacy PATA interfaces with our EDC DOMs, Compact Flash , 2.5” PATA SSD and SATA Interfaces with CFAST, mSATA, M.2, SATA Slim, 1.8” SATA SSD, 2.5” SATA SSD, SATADOMs, ServerDOMs, nanoSSD. Innodisk also carries removable storage in SD, microSD, and USB interfaces. All these form factors are supported in wide temperature ranges -40°C to +85°C to make them suitable for all industrial applications. Innodisk’s InnoRobust product line is our most rugged design tailored for Aerospace and Defense designed to meet the industries’ stringent standards, and also exceed many critical performance requirements. With so many products that can be customized to fit different industry needs, Innodisk’s portfolio is truly one of variety and innovation. Innodisk will display its server memory products that include DDR4 and Load-Reduced DIMM modules. Innodisk DDR4 operates at 2133Mhz with capacities up to 64GB. DDR4 is 30% more power efficient with lower voltage requirements. This benefit allows for significant power savings in data centers. Also designed for high performance computing are Load-Reduced DIMMs. These modules use a buffer to reduce to the load to increase system memory capacity without a register. Innodisk’s also carries registered DIMM modules that are designed to ensure data integrity at the device and system-level of the server. Innodisk’s embedded peripheral modules increase your system’s connectivity to various applications. Embedded Peripherals provide LAN, Serial Port, CANbus, Storage and Display functionality to embedded systems. Innodisk is dedicated to creating expandable, space-efficient signal conversion modules in order to increase the flexibility our customer’s embedded solution while lowering their total cost of ownership. Innodisk has experience with most common signals including PCIe, USB, SATA, PATA, SD and Displays and packaged them in a wide range of space-saving form factors. Flash Memory Summit is the world’s largest event featuring the trends, innovations, and influencers driving the adoption of flash memory in demanding enterprise data center storage and consumer applications. It also showcases the latest in flash memory design with over 10 simultaneous tracks and 14 keynotes speakers. Innodisk is a service driven provider of flash memory and DRAM products for the industrial and enterprise applications. With satisfied customers across the embedded, aerospace and defense, cloud storage markets and more, we have set ourselves apart with a commitment to dependable products and unparalleled service. This has resulted in products including embedded peripherals designed to supplement existing industrial solutions and high IOPS flash arrays for industrial and enterprise applications. The expanded business lines are leading our next step in being a comprehensive solution and service provider in industrial storage industry.